This chain lubricant spray penetrates deep to lubricate roller chains, inner chain links, pins, and bushings. Even with chains operating at a high RPM, our roller chain lube thickens to repel dirt and stay in place while lubricating and protect the chain from rust. Rating out of 5 stars. ** Proper maintenance for roller chain is cleaning and lubricating not only the external parts (chain and sprockets) but also the internal parts (chain links) of the chain. 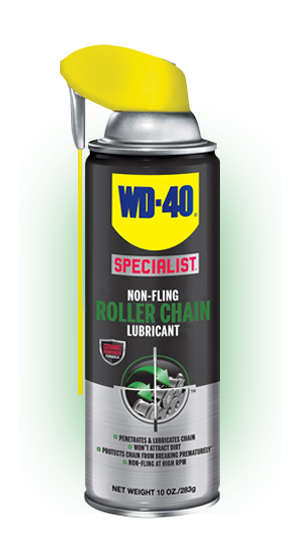 WD-40® Specialist® Non-Fling Roller Chain Lubricant lubricates deep into chains and thickens to repel dirt and stay in place even at high RPMs. The chain lube’s ceramic reinforced formula repels dirt and helps keep the lubricant from flinging off the chain during use. Unlike other chain lubricant sprays, WD-40 Specialist Non-Fling Roller Chain Lubricant penetrates into inner chain links, pins, bushings and rollers to protect chains against rust and breakage.